Late summer is so lovely with it's slightly cooler days, still warm but no longer oppressively so. And with those lovely days come the bounty of heirloom tomatoes. Red, yellow, green, multi-colored, irregularly shaped and heavenly sweet heirloom tomatoes. The farmer's markets are exploding with both the small cherry sized ones and, my favorite, the giant beauties that are so perfect for slicing. Tomatoes are the most commonly used vegetable in the Middle Eastern kitchen all year round. But we never pass up an opportunity to showcase the short-lived season of the heirlooms. Roasting any tomato helps to bring out their sweetness and flavor but roasting the heirlooms creates an explosion of tomato deliciousness and they are like candy. So good, in fact, that they are the stars of this simple appetizer. Because we're likely to be grilling during the summer, we like serving a grilled appetizer as well and our go-to recipe is for a simple tartine. That is, a slice of good crusty bread, brushed with olive oil and grilled until lightly golden. Then I top it with whatever I have on hand like pears and blue cheese, apples and cheddar or, in this case, some gorgeous roasted heirloom tomatoes and tangy feta cheese. You can season these simply with black pepper and a good pinch of sea salt. But it's an ideal showcase for our favorite spice blend, za'atar. Be warned, though, that you should probably roast more tomatoes than the recipe below calls for because they will be eaten right off the pan by anyone around and you'll be lucky if any make it to the actual tartines. Slice the heirloom tomatoes and place on a baking sheet lined with parchment paper. Drizzle with two tablespoons of olive oil and sprinkle with the za'atar. Roast in the oven for approximately 30 minutes or until the tomatoes are starting to get a little color but not burned. Brush the slices of Italian bread with the remaining tablespoon of olive oil and grill or toast in the oven for approximately 10 minutes or until lightly golden brown. 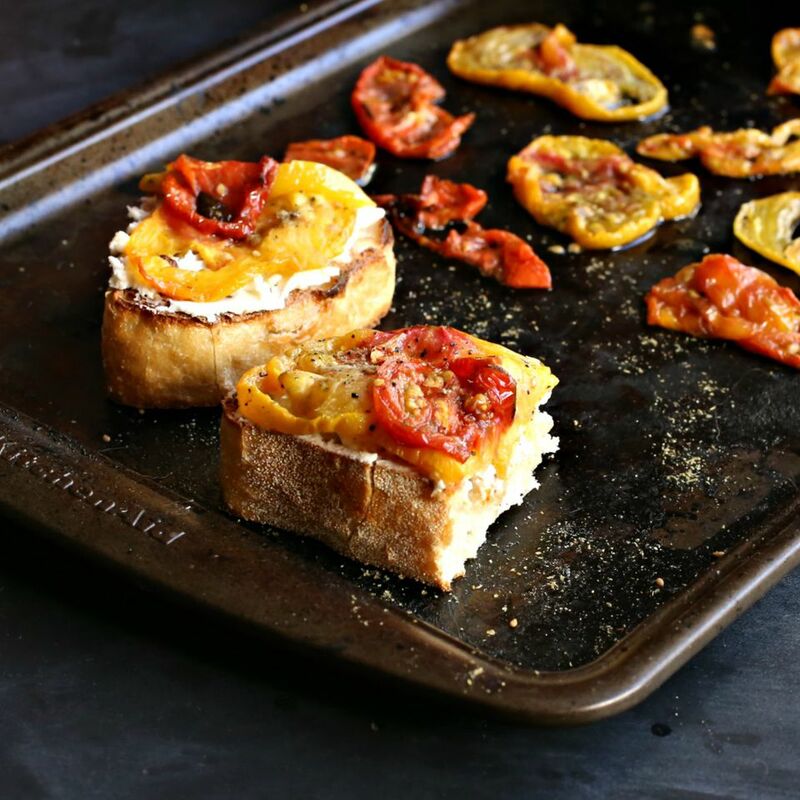 Spread each slice with the softened feta cheese and top with the roasted heirloom tomatoes. Cut each slice in half and serve warm as an appetizer with a cocktail or glass of wine.